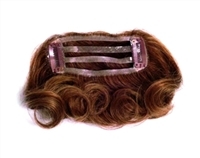 Integration Hairpieces: Pull Thru Hair Pieces - Perfect Solution -Female Pattern Baldness & Thinning Hair We Price Match! Our Integration hairpieces are the perfect solution to thinning hair; instantly adds length and volume! Simply pull your own hair through the holes, and combine (integrate) it with your new hair for a perfect blend. If you suffer from Female Pattern Baldness- View our many various styles to find the piece that works best for your own hair loss needs.